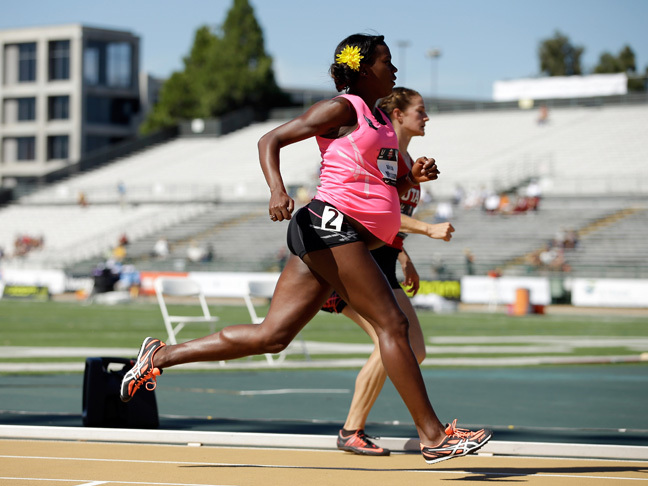 I was amazed when I saw a clip of the very pregnant Alysia Montano running an 800-meter race at the U.S. Championships on The Today Show this morning. Like me, the Olympian is just six weeks from her due date. Unlike me she was sprinting in a race. The only way I'm running (really, it's more of a weird waddle-hop at this point) is to get to the fro-yo place before it closes. Pilates is tough enough for me right now. The giant belly! The pelvic pain! The clumsiness…oh, the clumsiness. I'd be face-planting on the track before I even finished the first lap…if I hadn't already passed out from lack of oxygen. My mom, however, wasn't as inspired as I was — she was appalled. I see her point; eight months preggo is awfully pregnant to be running and it is a little startling to see that bump flying around a track. However, Montano is a former Olympic champ (not a casual runner at all) and she got permission from her doctor before she participated in the race. In fact, even if you're not an Olympian, Nancy Snyderman, MD, NBC's chief medical editor, says there's no reason to stop running. What matters most is that you're fit and cleared by your doctor. "The amniotic fluid provides cushion for the fetus and blood will not be shunted away to other parts of the body enough to harm mom or fetus," she adds. "Even the issue of stamina is a moot point. Balance may be affected a little from a shifting weight load but only minimally." The 28-year-old runner, who is expecting her first baby, received a standing ovation from the crowd when she crossed the finish line. And people on Twitter are calling Montano an "inspiration" and "superwoman." I agree!